Adopted by the Nazi Party in the 1930s, Hitler’s infamous “sieg heil” (meaning “hail victory”) salute was mandatory for all German citizens as a demonstration of loyalty to the Führer, his party, and his nation. August Landmesser, the lone German refusing to raise a stiff right arm amid Hitler’s presence at a 1936 rally, had been a loyal Nazi. And then on June 13, 1936, Landmesser gave a crossed-arm stance during Hitler’s christening of a new German navy vessel. In 1937, fed up, Landmesser attempted to flee Nazi Germany to Denmark with his family. But he was detained at the border and charged with “dishonoring the race,” or “racial infamy,” under the Nuremberg Laws. The secret state police also arrested Eckler, who was several months pregnant with the couple’s second daughter. 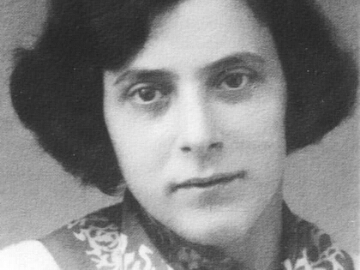 She gave birth to Irene in prison and was sent to an all-women’s concentration camp soon after her delivery. Eckler is believed to have been transferred to what the Nazi’s called a “euthanasia center” in 1942, where she was murdered with 14,000 others.